Cadillac’s all-new ATS has been unveiled at the 2011 North American International Auto Show, signaling America’s most significant challenge to Germany’s dominance in the compact luxury sport sedan segment. Of the three German manufacturers, Audi, Mercedes-Benz and BMW, Cadillac has set their sights primarily on the BMW 3 series, who has led the compact luxury segment for years. 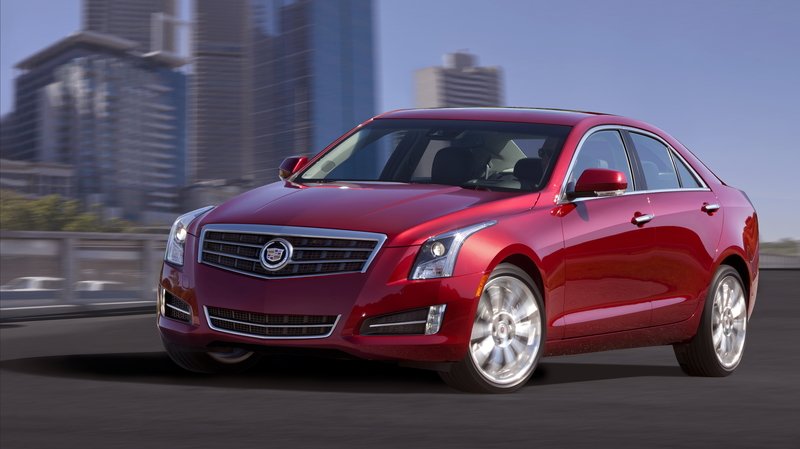 The 2013 ATS brings a high level of weight reduction in order to compete with the competition. To reduce the curb weight a combination of lightweight, high-strength steel, magnesium, aluminum and even natural-fibers have been used throughout the vehicle. The ATS’ hood is comprised of aluminum, while the engine mount brackets consist of even lighter magnesium. These savings allow the ATS to weighs in at less than 3,400 pounds, one of lowest in the segment. Weight has been reduced, but to compete with established models such as the 3 series, Mercedes C-Class and Audi A4 driving dynamics and handling need to be up-to-par. To fulfill these needs the ATS has used a multi-link, double-pivot MacPherson-strut front suspension, and the ATS is the first Cadillac to offer a five-link independent rear suspension. This, combined with the ATS’ nearly perfect 50/50 weight distribution should give the vehicle enough cornering and road-going performance to hold its own. Other major mechanical aspects of the new ATS are its different engines and gearboxes. The North American market will receive three different power plants, in the form of two four-cylinders and one six-cylinder. 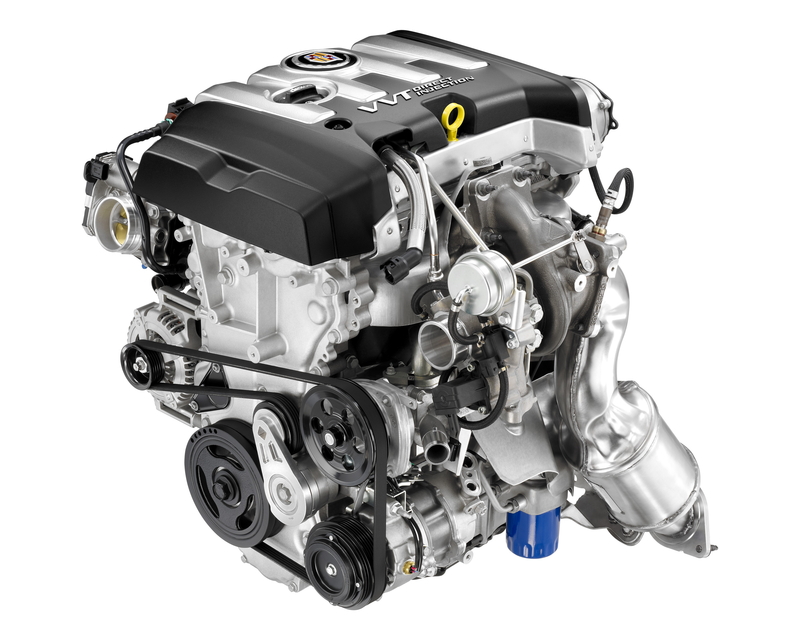 The base engine is a 2.5-liter four-cylinder developing 200 hp and 188 lb-ft of torque. An all-new 2.0-liter turbocharged four-cylinder with 270 hp and 260 lb-ft of torque gives customers an option for greater performance and more fun behind the wheel. Rounding out the engine offerings is a 3.6-liter V-6 with 318 hp and 267 lb-ft of torque. The power from these engines is delivered to the wheels via a choice of two transmissions, a six-speed automatic or six-speed manual. 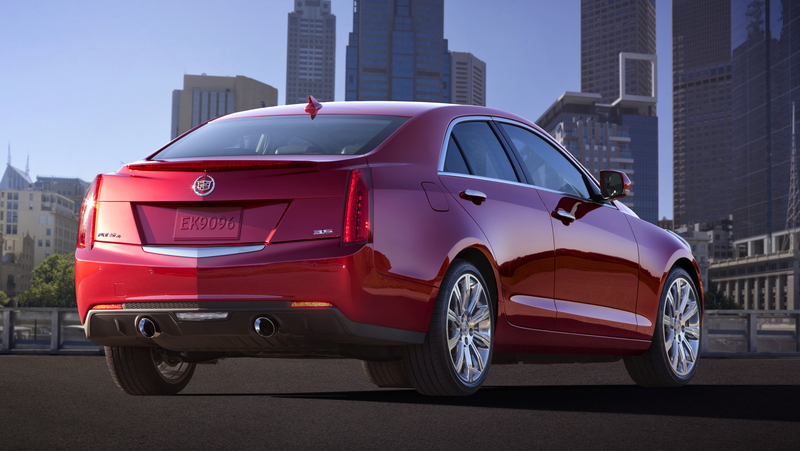 The ATS is also available in either a rear-wheel drive or all-wheel drive configurations. In terms of mechanical makeup, the ATS definitely seems to match up well with its German counterparts, but what about the interior? In years past some GM vehicle have scored big in performance and handling, only to come up short with interior design and styling. Well, you’ll be glad to know it seems like the designers at Cadillac have gotten the message, making the ATS’ interior both luxurious and driver-orientated. 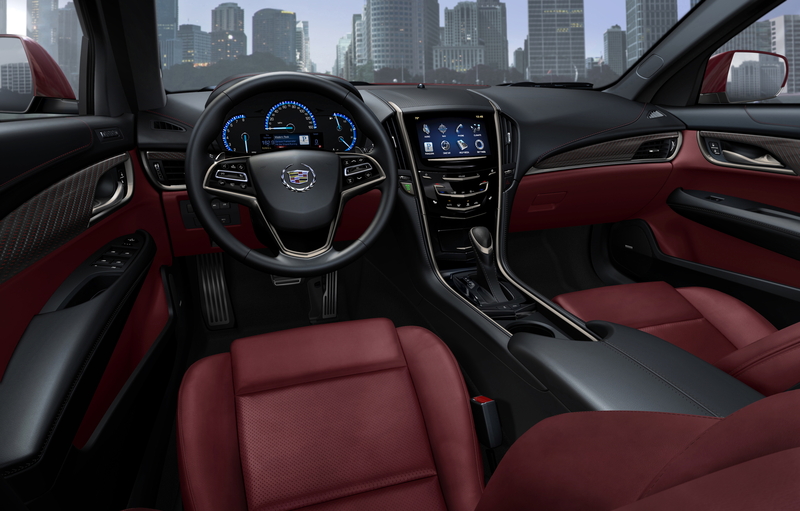 One of the major features of the new interior is the Cadillac User Experience (CUE). The entertainment and information system allows for the pairing of up to 10 technological devices, such as Bluetooth-enabled mobile devices and MP3 players to be integrated with less buttons and controls than traditional setups. The CUE system is controlled from an eight-inch LCD touch screen, located in the center of the vehicle’s dashboard. The ATS’ interior comes in three “collections”, luxury, performance and premium. BOSE surround sound and navigation systems are available on all three, with both systems coming standard on the premium collections.